Jeep has had its fair share of pickups in the past, from the 1963 Gladiator to the Scrambler and Comanche of the 1980s. The 2020 Gladiator is the latest pickup to make headlines. It’s based on the best-selling Wrangler and adds plenty of hauling prowess, off-road finesse, and versatile engineering to its list of top features. Here’s what you can expect to see on the 2020 Jeep Gladiator ahead of its spring release. The all-new Gladiator sports a design that’s flexible and functional. It comes in four trims — the Sport, Sport S, Overland, and Rubicon — and boasts a front grille with widened slots for enhanced airflow, a three-position tailgate, and either a zipperless soft top or three-piece hard top. It also features unique elements such as a folding windshield, removable four doors, and a spare tire that hangs underneath. Meanwhile, the body comes styled with a crew cab configuration, short 5-foot bed, and wheelbase spanning 137.3 inches. If you need to load and unload cargo, you’ll find swiveling tie-downs up front and out back to keep your items secure, plus an available roll-up tonneau cover for added protection. The 2020 Gladiator is no doubt a powerful pickup. It runs with a base 3.6-liter Pentastar V-6 generating 285 horsepower and 260 pound-feet of torque. A 3.0-liter EcoDiesel turbo V-6 is also in the running and churns out 260 horsepower and 442 pound-feet of torque. Both units pair with engine start-stop technology to preserve fuel when idle. Rounding out is a standard six-speed manual transmission, while an available eight-speed automatic comes standard on the EcoDiesel. The Gladiator easily travels over rough terrain like a champ thanks to 11.1 inches of ground clearance and a 43.6-degree approach angle. You can also lend credit to its four-wheel-drive powertrain, forward-tilting rear shock absorbers, and third-generation, heavy-duty Dana 44 front and rear axles. The true off-road aficionado, however, is the Rubicon. This trim comes standard with 33-inch all-terrain tires, an electronic disconnecting front sway bar, and a pair of aluminum-bodied, monotube shocks. Add in a forward-facing camera for detecting off-road obstacles, and you have a Jeep that can handle anything you throw its way. Next, we cover the Gladiator’s hauling capacities. It features a 2-inch receiver, class four hitch, and a choice among four- and seven-pin connectors. The result? A payload rating of 1,600 pounds and towing potential of 7,650 pounds, both of which are best-in-class for the midsize pickup segment. The Gladiator’s cabin is nothing short of sophisticated. 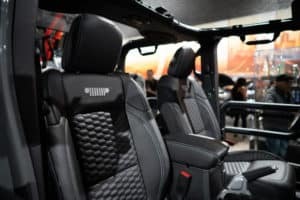 It features a Uconnect system with 5-inch touch screen, foldable rear seatbacks with hidden storage compartments, and multiple USB ports available for front and rear passengers. Meanwhile, optional upgrades include an updated infotainment system with GPS navigation, leather-trimmed upholstery, and a removable Bluetooth wireless speaker. The Gladiator pairs its athletic performance with unmatched safety. It features 80-plus available systems designed to boost peace of mind. These include adaptive cruise control, blind spot monitoring, forward collision alert with active braking, and a rearview camera with dynamic guidelines — all the equipment you need to feel safe behind the wheel. There’s no doubt the 2020 Jeep Gladiator is a dependable midsize pickup. Are you excited about its upcoming release?